Each traveler has a preferred manner of exploration. Some like museums or nature, but I always try to integrate with the locals to the greatest extent possible. This doesn't mean merely snapping photos of strangers on sidewalks or public places and making assumptions about their lives. It means taking the time to actually speak with them and learn a bit about their personality and story. For me, it's the most important part of every journey, though it's not always possible due to language barriers or safety reasons. 1. 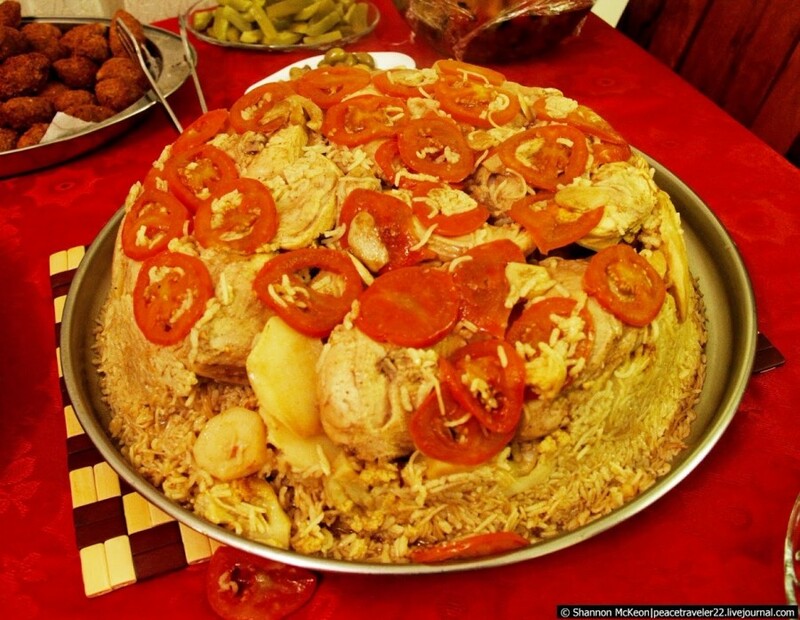 In the comments yesterday, many people thought the dish was plov, or some other cuisine from Central Asia. One creative thinker wrote that the meat atop the pile of rice was frog legs. 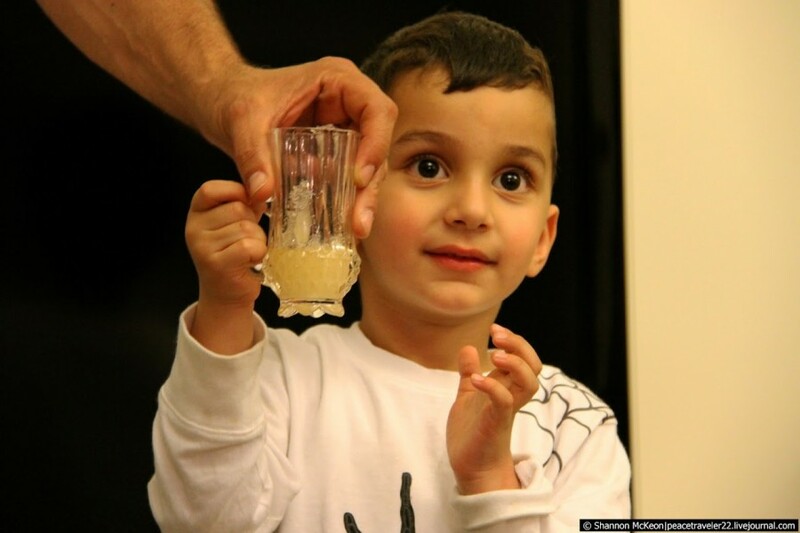 :) Good guess, but Maqluba is typically made from rice, vegetables and some type of meat such as chicken or lamb. All ingredients are placed in a pot, which is then turned upside down to give the meal its unique presentation. In fact, the word "maqluba" translates literally as "upside-down" in Arabic. We had two variations of the dish, with each mold having different vegetables. Yesterday's version had carrots, potatoes, raisins and lots of onions. The second dish, pictured here, had the same meat but different vegetables like tomatoes and cauliflower. I don't like dark meat, so the dish wasn't very tasty for me. I ate mostly the lower portion, which consists of only the rice and vegetables. If you want to know how to make the dish, there's a recipe at this site. You can make vegetarian versions if you don't eat meat. 2. 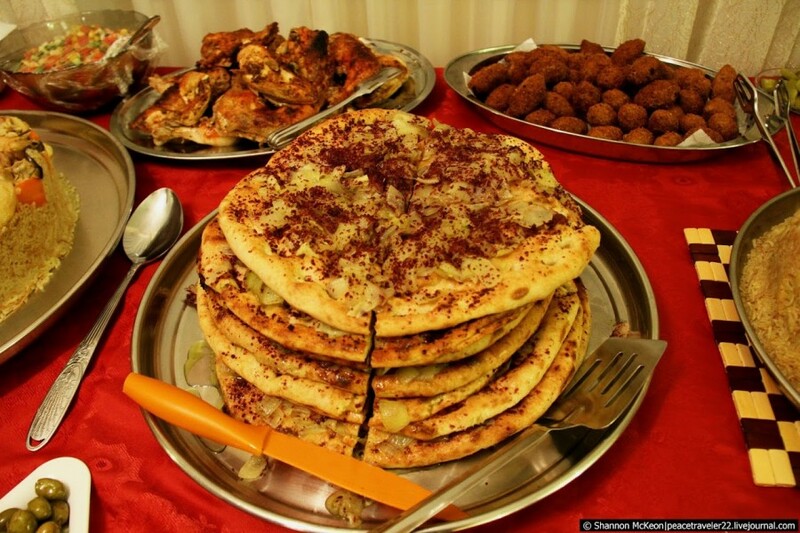 At the meal, we were also served a lot of traditional foods like falafel, wonderful salads mixed with onions, peas, diced tomatoes and cucumbers, hummus, and this tasty flatbread covered in the strongly favored spice "sumac," and brushed with olive oil and onions. Delicious, but I can't find this spice in my local market. 3. After the meal, we had hot tea and fresh fruit, served by one of the young men in the family. Just a beautiful child, with whom I fell in love and could not stop hugging! I came to know the family through his father, also pictured in the photo. 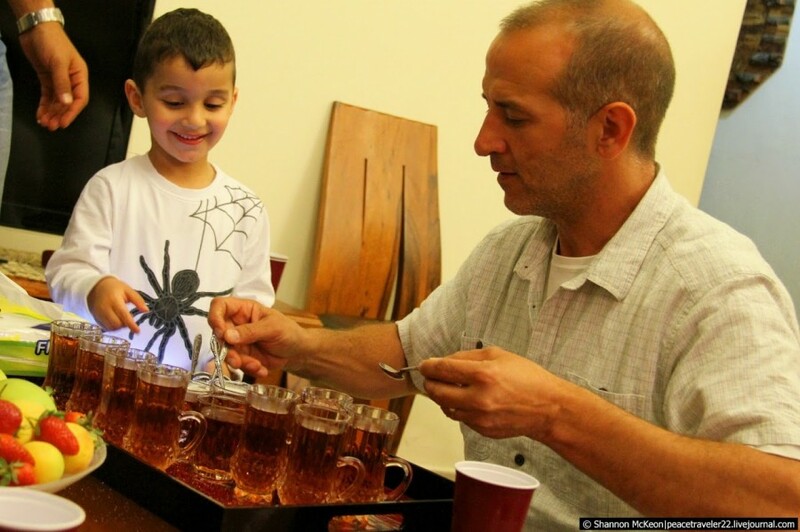 He's an American who married a Palestinian woman and travels back to the region frequently. He met her at a local bar when he was in the city on military duty. Btw, I really like the tea and especially the coffee in this region. It's incredibly rich and flavorful, and the coffee makes the tongue dance in happiness because it's spicy and fragrant! 4. I'm always drawn to children in travels, and question whether I would be able to avoid them in places like Vietnam or India where it's so common for cute kids to work as day traders selling bracelets and other items. I know it's bad to give the kids dollar bills and buy the products because it only supports the adults using them as cute pawns and day laborers, keeping them out of schools and away from education. But to turn your back on such an innocent youngster seems heartless. I've not yet traveled to these places, so I guess I'll learn how to deal with it when the problem stares me in the face. 5. 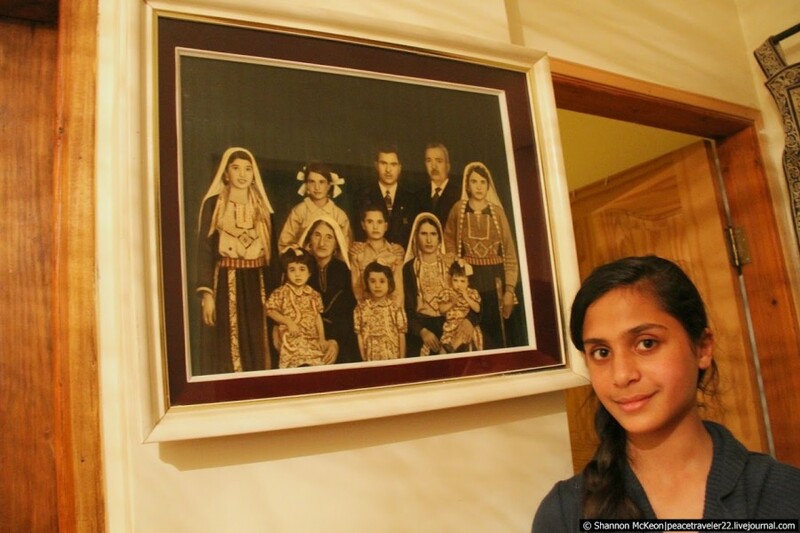 Most members of this family are very conservative Muslims. They didn't want to be photographed, especially the females. However, Rania is different. She doesn't practice Islam and wants to leave for the West and eventually attend university there. She never wears hijab, and her family doesn't force her to, even though all of her other sisters wear the garment. 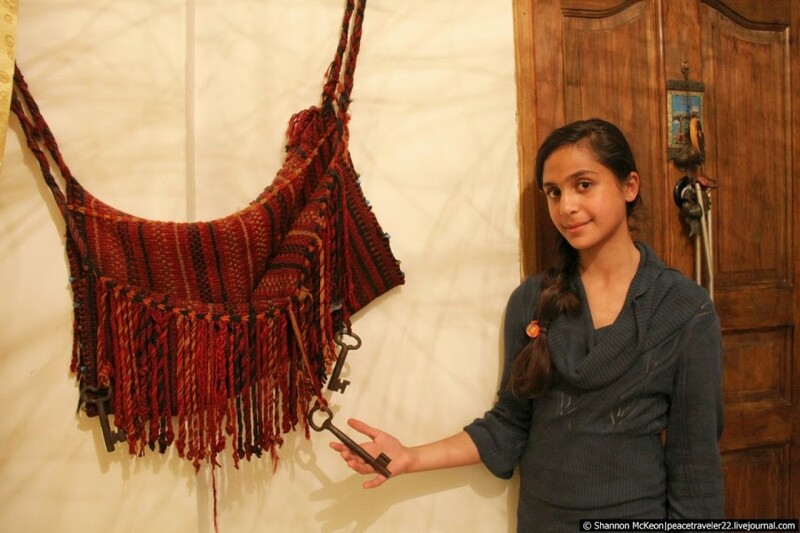 Rania took a lot of time to show us around the home and explain the significance of the key pictured here. In the West Bank, and in Palestinian homes, it's common to see actual keys, or large reproductions or artistic murals depicting keys, including on the Separation Wall and at the entrance to some of the refugee camps I visited. What does the key symbolize? 6. 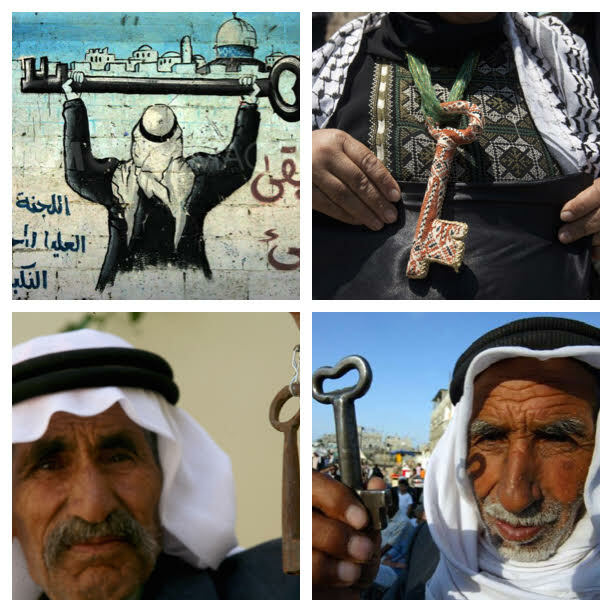 To Palestinians, the keys represent the "right of return," a principle deeply entrenched in their mentality. The phrase is self-explanatory, but it simply means that the first-born generation of refugees and their descendants have a right of return to property they left behind or were forced to vacate due to the 1948 war, which led to the founding of Israel. They view it as a sacred right, and the keys serve as a reminder of their former homes and land. The Israeli government doesn't view the admission of Palestinians to their former homes in now Israeli-controlled areas as a right, but rather a political claim to be resolved as part of an eventual peace settlement. When will such a settlement come? I think never, and certainly not in my lifetime. I spent almost two weeks in the West Bank, meeting locals on the street, sharing meals and conversations with them. For all who have climbed into my comments before shouting that they're all extremists and wish death to Israel, I will never believe it. 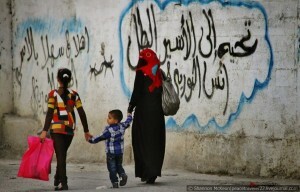 Yes, it's the stated position of Hamas, but is it the ordinary wish of the average Palestinian? This was not my impression. Like people all over the globe, they simply want peace and stability. To me, they were incredibly kind and hospitable, even though many Palestinians didn't hesitate to express their dislike of U.S. foreign policy to me. Of course their position is entirely understandable, as the U.S. sends more financial aid to Israel than any other nation. All these cries about evil Jews, Hamas, radical Islamists...they fall on deaf ears for me. I've always said that people are human first - I don't judge based on ethnicity, religion, gender, sexual orientation or anything other than how a person treats me. 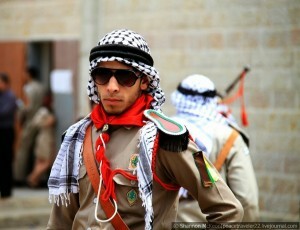 In the Israeli-Palestinian conflict, I'm a complete neutral. I see the challenges and tragedies faced by both sides. There are no winners. If I had a Jewish heritage, perhaps I would feel differently, but I have absolutely no connection or emotion for Israel after visiting this region. Sorry, I know many of my readers are Jews and some now call this country home, but I'm only sharing my honest opinion and feelings, as I always do. You are free to disagree with me. I wish to thank this family for their time, the lovely meal, and for many interesting and thought provoking conversations and experiences. If you have not yet read my other stories from Palestine, see links below. It isn't true. :) But food is an integral part of any culture. When I travel with my Russian friend, we never eat at local restaurants. We usually grab food from a local market and eat in the car or hotel. You don't trust russian restaurants? I don't usually have a choice. In Russia, I'm usually traveling with "macos," one of the top bloggers on LJ. He's a dictator. :)) For him, it's necessary to arrive at the hotel early evening so he can process photos, write texts for his blog, etc. So he doesn't want to waste time in restaurants. But I've eaten at some Russian road side cafes and the chain "Mu-Mu."